Welcome to Florida Anchor and Barrier LLC. 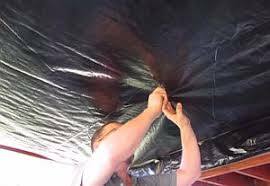 We Install & Repair Mobile Home vapor barriers, Tie downs, Hurricane Anchors, Repair Sagging Floors, Re-Level Mobile Home Floors and Most Mobile Home Repairs. We Also Install and Repair Mobile Home Skirting and Mesh for Varmints! Free Written Estimates and Consultations. 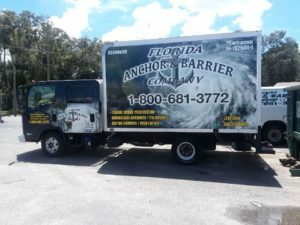 Florida Anchor & Barrier LLC "State Certified General Contractors #CGC- 004138"
Mobile Home Vapor barriers are critical to you and your families safety. Mobile home straps prevent high winds from lifting or moving your mobile home during storms. Tie down anchors are driven into the ground, anchoring your mobile home and preventing movement during high wind events. Mobile Home Vapor barriers are the most Important area of your home. If torn or damaged, they allow moisture into your home causing, wet insulation, rotting wood, soft and sagging floors, as well as mold, mildew and pest. Contact Us at Florida Anchor and Barrier for a Free Inspection and Consultation. Sagging floors and Soft Floors in Mobile Homes are usually caused by damaged vapor barriers, leaky roofs, windows, leaking water heaters, dish washers and leaky toilets. They’re also a breeding ground for mold and mildew. Contact Us at Florida Anchor and Barrier for a Free Inspection and Consultation. Mobile Home Floors in Florida will need to be re-leveled from time to time. Floridas wet weather causes the ground to become soft allowing your mobile home blocks to move. There are other causes so Contact Us at Florida Anchor and Barrier for a Free Inspection and Consultation. Keep out damaging moisture and mildew and stop Health Hazards in your mobile home. 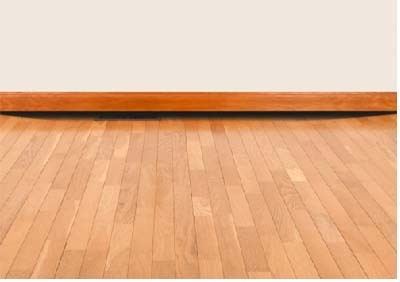 Prevent rats, snakes, spiders, ants and roaches from entering through damaged floors and vapor barriers. Dramatically lower your electric bills every month. Damaged vapor barriers allow air to escape and enter your home. Stop mobile home floors from sagging and rotting. Your flooring will be ruined by sagging floors and soft floors. Repair sagging and soft floors in your in your mobile home. Replace old insulation with new R-19 Insulation in your mobile home floors. Replace and repair sagging and soft floors / Install new laminate flooring. If Your Mobile Home has been affected by Hurricane Michael we can help you now! Is Your Mobile Home ready for a hurricane? Take advantage of our Free Mobile Home Hurricane Anchor Inspection as well as inspecting the rest of your mobile home. If you have trees close to your mobile home that will cause damage to your mobile home during high winds, these trees need to be trimmed to make sure they don’t damage your mobile or manufactured home in Tampa or Clearwater. Power lines that are too close to mobile homes during a hurricane are dangerous because they will come into contact with the mobile home, which can be very dangerous for anyone inside the home. Gas tanks outside mobile homes during a hurricane that are not tied down to a concrete pad with anchor bolts embedded in the concrete with at least 4 anchor bolts are dangerous and should be corrected right away. If you have loose or exterior trim or panels on your mobile home during a hurricane, these can become wind borne debris during storms and if your mobile home has exterior trim or paneling missing then there is a good chance you’ll have water damage inside your mobile home. If you have flashing that is missing around the exterior roof valleys, chimneys, wall penetrations, eaves, skylights and around exterior windows and doors, you will have water in your mobile home during storms. Flashing that is missing allows water to penetrate your mobile home and that will cause water damage to the interior of your home. Bent and rusted I-beams are a sure sign that the weight of your mobile home is not properly supported, as well as masonry piers supporting your mobile home are not properly spaced to support the mobile home on the mobile home lot. Doors and windows that are hard to open and close are good signs that a mobile home I-beam is bent or out of level. Damaged or rotting wood framing is always a sign of structural failure. The mobile home wood floor is covered by a floor covering and a moisture barrier underneath the mobile home. Damage floors may show up as soft spots on the floor and we’ll find this is an inspection of your mobile home floor. Rotting floors is a sure indication of moisture intrusion into the mobile home. Checking plumbing like toilets, water heaters and washing machines to make sure they are not leaking. 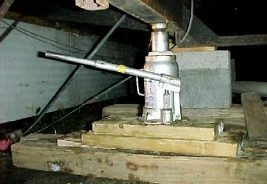 If there are masonry piers supporting your mobile home that have cracked or chipped then the structural support of the manufactured home is on its way to being damaged. 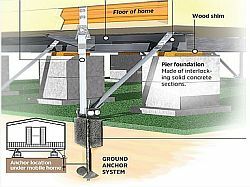 If more than three of your mobile home’s piers are damaged, then we’ll give you an evaluation the structure of the foundation of your mobile home. If the cap on the masonry piers is cracked or rotted during a hurricane it will not be able to support the weight it was designed to support. Cracked, rotted or damaged pier caps must be replaced to ensure the mobile home stays level. Many time wooden wedges are used to fill gaps existing between the pier cap and the structural I-beam. While this is an accepted method for leveling a mobile home, strong winds will cause them to vibrate and cause the wedges to come loose, we always replace these wood wedges with concrete. Metal straps are the best method of anchor attachment for mobile homes. The mobile home anchor straps should be galvanized steel 1-1/4 inches wide and 0.035 inches thick. In high wind areas, two straps are used to properly attach the anchor to the mobile home frame. One strap extends vertically from the anchor to the outside mobile home sidewall, and the other strap should wrap around the steel frame I beam and connect to the anchor at an angle of 45-degrees. The number of mobile home anchor straps needed during a hurricane on each side depends on factors including the length of the mobile home, the type of soil under the mobile home, the capacity of the anchor in the soil, and the expected wind speeds at the lot where the mobile home is installed. 8 to10-foot spacing was common with older mobile home installations along the length of the mobile home while newer installations use straps at only 4 or 5-foot spaces. If the mobile home anchor straps on your mobile home were installed with more than 5 ft space between the straps we’ll inspect your straps to determine whether they’ll provide enough resistance during a high winds. Anchor straps should fully wrap around the I-beam of the mobile home. If the straps aren’t wrapped all the way around the mobile homes frame, the straps could come loose during storms and move the mobile home from its foundation. The angle of the anchor strap should be 45-degrees to provide the best anchor to resist horizontal and vertical forces during storms. Our certified installers will evaluate the installation of mobile home straps and relocate the anchors if necessary. Stabilizer plates are attached to the mobile home anchors. Some mobile home manufacturers build anchors with plates attached to a sleeve that fits around the anchor stem. These can be highly effective during storms at reducing the amount of movement from side to side of the anchor system of the home. Mobile home anchors should be installed flush with the ground; anchors not flush with the ground should be reinstalled so that the anchor is flush with the ground. Bent mobile home anchors should be replaced with new anchors. If a strong pull on the anchors pulls any of the anchors out of the ground, then they move too much during a severe storm. Longer anchors with a large stabilizer plates will have to be installed. If there are loose or sagging mobile home anchor straps, not providing enough tension to properly anchor the mobile home during storms, or a strap can be easily shaken; it’s too loose and should be tightened. Much of this is technical and if you have any questions please contact us and we’ll explain it to you, and we’ll gladly give you a free inspection of your mobile home to make sure your ready for any storms that may come our way this year. If you’re returning to your Mobile Home after Hurricane Michael here is an extremely Important article to to help you get your home back to normal!